Recent elections throughout the United States have seen bills and measures introduced in order to combat genetically modified organisms (GMOs) or genetically engineered (GE) products in the U.S. food supply, most notably in Oregon, Vermont, Washington and Hawaii. Most of these bills have been written to require food producers to label their products if they contain GMOs or GE products. Monsanto is a leading producer of GE seeds and pesticides, most notably Roundup, and earns literally billions of dollars each year for its seeds and chemicals. The company does not want GMO labeling because of stigmas that surround GMOs and GE products. While people can debate the safety of GMOs until they’re blue in the face, it’s important for the public to know about Monsanto as a company and the tactics they have used to further their agenda. Monsanto talks about how much their technologies benefit the people on the planet, but they fail to understand how many lives their technologies have ruined by way of chemical poisoning, destroying the natural diversity of the Earth, and ruining the lives of farmers through outlandish lawsuits. Monsanto originally started producing food additives in the early 1900s. By 1940 they had moved to producing mostly plastics, and in the 1940s their chemical production started. 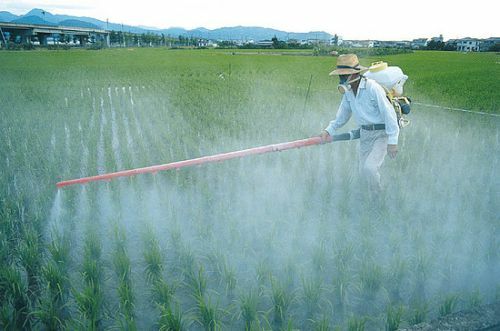 1944 saw the production of DDT, an insecticide that was found to kill mosquitoes but also found to be toxic to most wildlife, plant life, and humans. DDT was subsequently banned by the United States in 1977. Other notable Monsanto creations: polychlorinated biphenyl (PCB), banned by the US in 1979; Agent Orange, a chemical used in the Vietnam War that has since been linked to lasting defects within the body, especially in children born to people exposed to Agent Orange and has also been banned in the US. Monsanto also developed recombinant bovine somatotrophin (rBGH), which is the controversial bovine growth hormone so many dairy products say their cows are not treated with. If ruining the planet with chemicals isn’t enough, Monsanto has created a monopoly on the world’s seeds as well. Monsanto has created genetically engineered “Roundup Ready” corn, soy, and cotton, which means the seeds have been genetically altered at the cellular level to produce their own pesticides. Monsanto sells these seeds to farmers, and the farmers plant the seeds. Because Monsanto has a patent on these seeds, they own the rights to the seeds, as well as the rights to the offspring of the seeds. This means should a farmer grow corn, and then use the seeds from the corn to grow another crop the next year, Monsanto can sue the farmer for using second-generation seeds because of the original patent, and they have sued their own farmers many times. Seeds are not cheap, and considering Monsanto has a monopoly on the seeds, farmers have to resort to either getting their seed from Monsanto each year, or go to organic seeds/conventional seeds (non-GE), which are more expensive and not as readily available on the market. 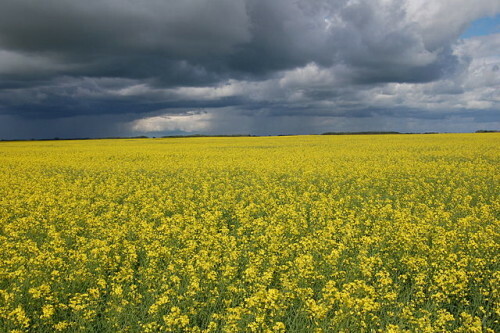 Monsanto has made it increasingly difficult for farmers who want to use non-GE seeds; should a Monsanto seed be found in a field that is conventional or organic, Monsanto can sue the farmer(s) of that field for having patented seeds in their crops without paying for those seeds. Seeds in general can be transported a number of ways: by humans, by the wind, or animals. 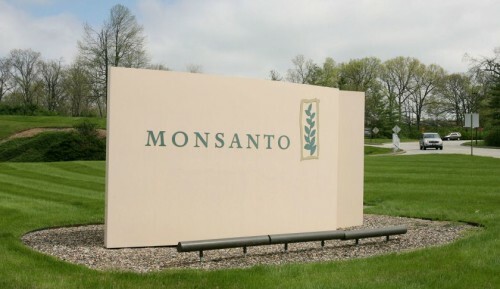 Monsanto has also acquired (through purchasing or mergers) a number of seed companies throughout the world, which in turn has made it difficult for other seed companies to offer products to farmers. But it’s not only in the states: the US government has pressured foreign countries who receive American foreign aid to buy Monsanto seeds or else risk not receiving full aid, as was the case in El Salvador in 2014 when the US government threatened to withhold over $250 million in foreign aid if the country did not purchase GE seeds from Monsanto. Through their tactics, Monsanto sues their own farmers (they even have an article on their website explaining why they do it! ); they have twisted the natural biodiversity of the earth’s crops by making only certain types of seeds available to farmers; they have cut out their own competitors by buying them; and they produce some of the most damning chemicals ever used on the planet. As a company they have also been able to infiltrate high ranking positions in the US Government, which has made it extremely easy to pass their agendas. 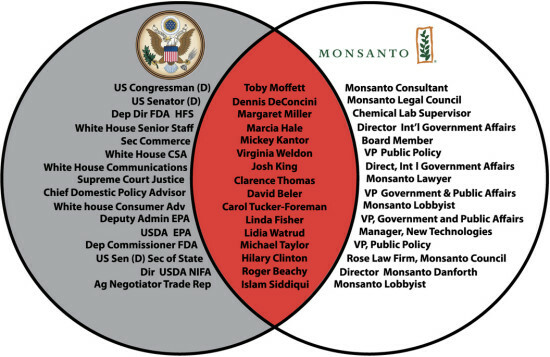 The FDA includes several ex-Monsanto executives, and lawyers who once worked for Monsanto now hold positions in Congress and the White House, as well as in the courts; Supreme Court Justice Clarence Thomas was an attorney for Monsanto in the 1970s, and happened to be the majority opinion for the 2001 Supreme Court ruling that made it legal for Monsanto to patent its GE seeds. But Monsanto isn’t all bad – they were the first company to mass produce light emitting diodes, or LEDs, which have become extremely popular in recent years for their excellent energy savings. But beyond the LED, it’s hard to find a positive impact Monsanto has had on the world as a whole. Regardless of whether or not you believe GMOs are safe, Monsanto the company is responsible for some pretty serious stuff and can only be regarded as an unnecessary evil, intent upon exploiting the US Government and American farmers while earning as much money as they possibly can. Do you think Monsanto is evil, or just following after the American dream? Do you think Monsanto deserves to sue the farmers that use and pay for seeds? Do you think the US Government should do something to address the number of ex-Monsanto employees on its payroll?